Weekend before last, I stood under a tent near the site of the old town spring. Rain was falling in sheets. The volunteer manning the sign-in desk thanked me for coming to work on the Heart-of-the-City playground, especially in such dreadful weather. “Are you skilled or unskilled?” she asked. Hmmm. That was a tough one. I do have some skills. I can touch type. Drive a stick shift. Ride a horse and a motorcycle and a skinny-tired road bike. Play the kazoo. Bake a mean blackberry cobbler. Diagram a sentence. Identify most of the birds at my suet feeder. Sew on a button. Ski down a green slope without falling more than once or twice. But I knew those weren’t the skills she was asking about. Not one of those talents would help build a playground. What was needed were folks who could set a post. Paint a picture. Operate a circular saw. Use a drill. “Unskilled,” I replied. And so I was assigned to the gravel crew. Two or three workers swept mud out of the way while others shoveled gravel into wheelbarrows and then dumped it onto the ground where the mud had been removed. Only it hadn’t really, because torrential rain was still coming down. 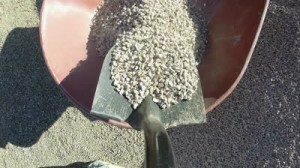 The dumped gravel was then raked smooth. I headed over to a group of teenagers who were loading a wheelbarrow. And I do mean loading. That wheelbarrow, its tire half-buried in mud, had a mountain of gravel in it. Rich Froning couldn’t have budged it. Not wanting to appear bossy to these exceedingly pleasant young people, I suggested—in the gentlest and most diplomatic way possible–that a tad less rock might be easier to push. “I can push it like it is,” one of the girls said. Nope. “Let me try,” a slightly-built young man offered. Nope again. They looked at me with expressions that I can only describe as wonder on their faces. “That’s a great idea!” one of them finally said. We spent the next couple of hours getting our job done in impressive fashion. Most of these young volunteers were bare-handed and wore tennis shoes, now clearly ruined, and flimsy plastic parkas given out at the sign-in desk. I’d worn a hooded rain jacket, knee-high rubber boots and leather work gloves, but within minutes we were all equally soaked to the skin. The rain never stopped. It never even let up. But the gravel crew proved ourselves to be a well-oiled machine. Sweep, shovel, push, dump, rake. Over and over and over again. I don’t know the name of a single one of the teenagers I worked with that Saturday afternoon. But I do know they gave their all to help build a playground that their own children will, I hope, someday be able to enjoy. A playground this whole town can be exceedingly proud of. We might have been unskilled workers, but I’ll say this for us.